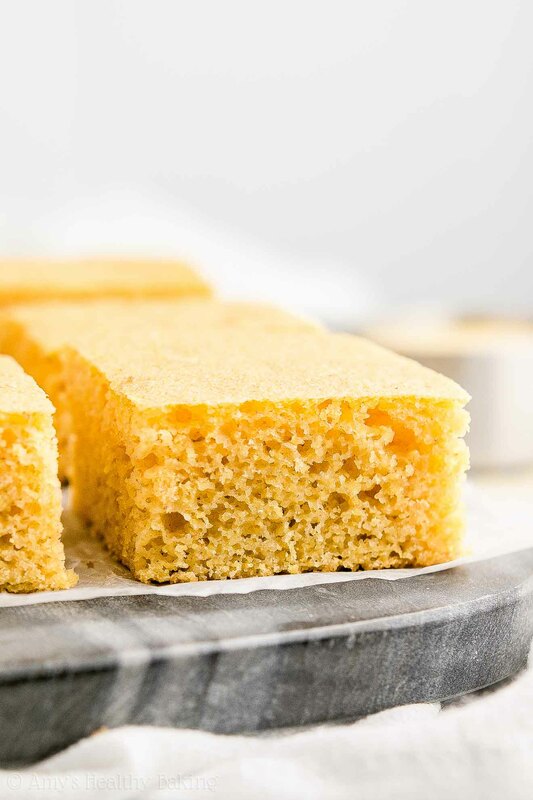 Learn how to make moist & healthy cornbread from scratch with this easy recipe! It’s really tender & flavorful, even with no refined flour or sugar! Only 54 calories! During the second half of April, I flew home to visit my family, and we bought tickets to a Saturday evening game to see the Oakland Athletics play the Boston Red Sox. Although Dad and I are the two biggest baseball fans in our family, Mom recently started to follow the sport about as much as we do, and even my brother (he used to bring a book to games and read the entire time!) came along with some of his college friends. Over the years, one of the main downsides of the Oakland Coliseum has been its food. Unlike other ballparks that started offering fun new options over the past decade or two, Oakland stuck with the traditional fare: hot dogs, sausages, nachos, chicken strips, fries, soft pretzels, peanuts, cracker jacks… All of the predictable foods. But starting last season, the A’s brought food trucks into the plaza right outside the stadium, and they roped off that area so only paid ticket holders could walk around and order. Since Mom and Dad hadn’t seen that area yet, I suggested that we headed there as soon as we passed through the Coliseum gates. Their jaws dropped as we wandered around, completely in awe of the different food trucks. Mexican, Korean, Japanese, Indian, Filipino, German, southern soul food, Italian ice, cupcakes… Although Dad loved the Cajun sausage jambalaya that he chose and Mom decided on pizza, I was secretly hoping they’d order from one of the two BBQ trucks. I had been craving cornbread all week and wanted somebody to split a piece with me! Instead, I baked this Healthy Buttermilk Cornbread when I returned back to my own house, and it was totally worth the wait! It’s really moist and tender, and this recipe is so easy to make. (No mixer required!) Although perfect for pairing with chili or BBQ meals, I just ate mine plain—it’s that good! 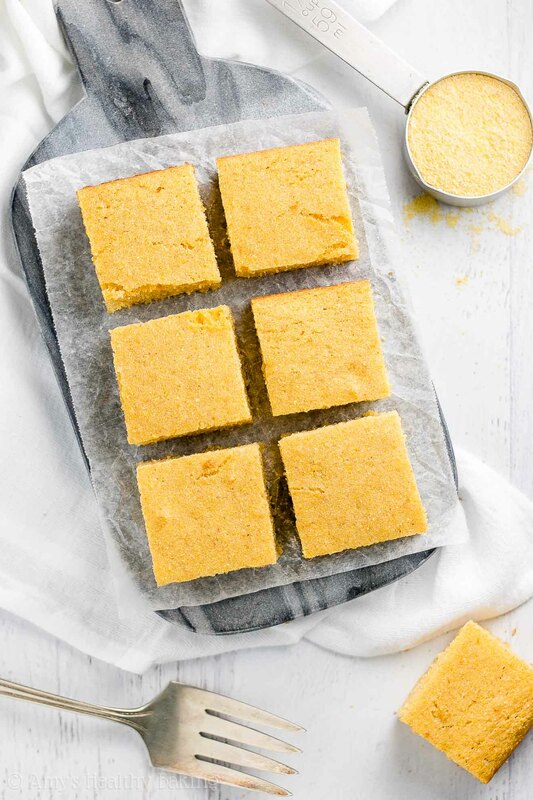 Let’s go over how to make this healthy buttermilk cornbread! You’ll start with cornmeal (like this!) and white whole wheat flour (like this!). It seems like most recipes call for equal amounts of cornmeal and flour, or sometimes even more flour than cornmeal, but those recipes lack a strong “corny” flavor to me. 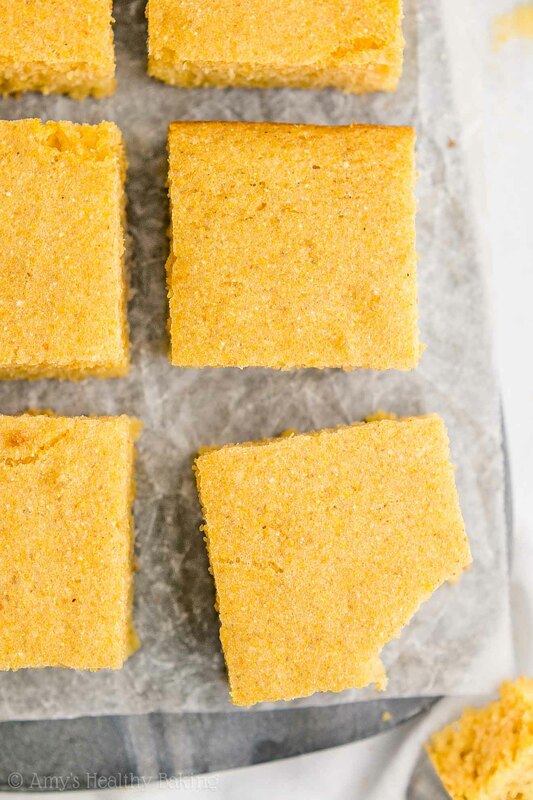 When I eat cornbread, I want the emphasis on “corn,” not “bread!” So in this recipe, you’ll use more cornmeal than flour. And yes—white whole wheat flour actually exists! It’s not a combination of white (aka all-purpose) flour and whole wheat flour. White whole wheat flour is made by finely grinding a special type of soft white wheat (hence the name! ), whereas regular whole wheat flour comes from a heartier variety of red wheat. This gives white whole wheat flour a lighter taste and texture, which makes this cornbread more tender and lets the corn flavor shine! Nerd alert! Not all cornmeal is the same! You want finely ground or medium grind cornmeal (like this!) for this recipe. Also, not all cornmeal brands weigh the same. Look at the side of your box or bag of cornmeal, and find where it displays the serving size in both cups and grams. You need 150g of cornmeal for this recipe. For some brands, that’s 1 ¼ cups, or 30g per ¼ cup… But for others, ¼ cup is 33g or 36g or even 43g. Yikes! So here’s the nerdy thing to do to make sure your cornbread turns out perfectly. Step 1: Divide 150g by the number of grams in ¼ cup of your cornmeal. For example, if your cornmeal is 33g per ¼ cup, divide 150 by 33. That equals 4.545. Step 2: Divide that number from Step 1 by 4. In our example, that would be 1.136. This is the number of cups of your cornmeal that you need! Step 3: If your decimal places look a little funky, like in our example, multiply just the decimals by 16. For our example, that’s 2.18, and I would round down to just 2. This is the number of tablespoons, in addition to that 1 cup of cornmeal, that you need! Nerd alert #2! It’s extremely important to measure the cornmeal and flour correctly, using this method or a kitchen scale. (← That’s the one I own!) Too much of either ingredient will make your cornbread turn out dry, rather than moist and tender. Psst… If you have a kitchen scale, you don’t need to do the math to figure out cups + tablespoons. You just need to weigh 150g of your cornmeal! Yay! We’ve made it past the difficult math-y stuff! ? On to easier topics, like the rest of the ingredients! 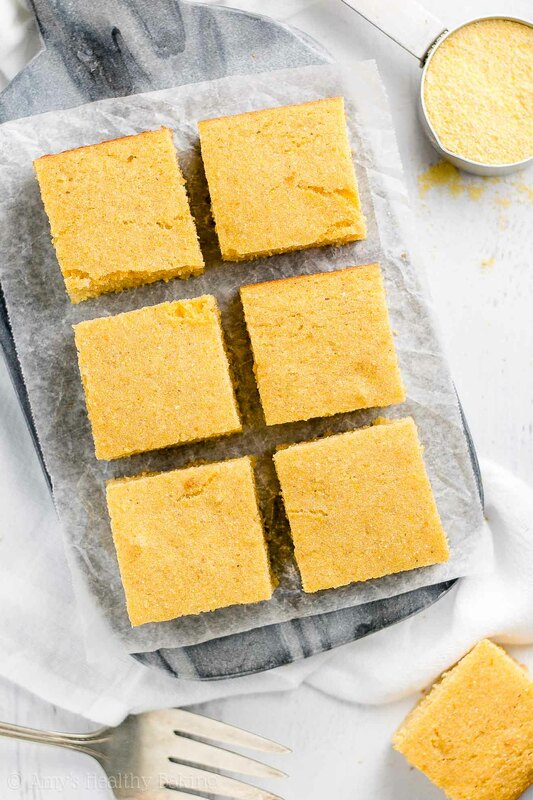 Unlike traditional recipes that use lots of melted butter or oil, this healthy cornbread only requires ½ tablespoon. Yes, that’s it! Instead, you’ll mix Greek yogurt into the batter. 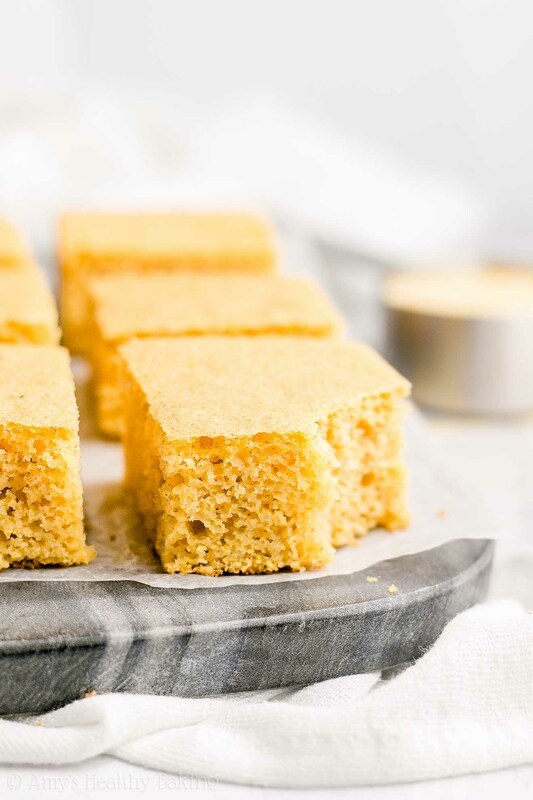 Greek yogurt adds the same moisture as extra butter or oil to your cornbread but for a fraction of the calories, and it gives your healthy cornbread a protein boost too! Then low-fat buttermilk also helps with the tender texture! I had almost a half gallon left over from making these and these (yum! ), so I used regular low-fat buttermilk. You can also make your own with any kind of milk and a little vinegar! Nerd alert #3! That acid, whether the kind naturally in buttermilk or the vinegar you add to your own milk, is a key part of this recipe. It reacts with the baking soda (a base) to help your cornbread rise and give it a more tender texture! 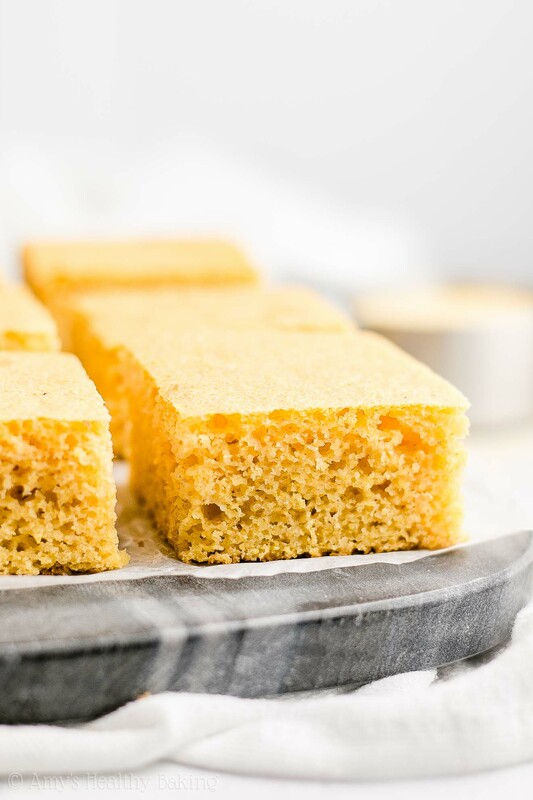 Instead of refined granulated sugar, you’ll sweeten your cornbread with a touch of honey! Because my family is split—some people like their cornbread on the not-so-sweet side, while others love lots of sugar—I always make mine with only a bit of honey in the batter, then serve it with a jar of honey on the side so people who love sweeter cornbread can drizzle a little extra on top. Then everyone ends up happy! How cozy does this cornbread look? While I still enjoy it warm or at room temperature, I actually prefer it cold and straight from the fridge… There’s something about having it chilled that really brings out the corn-and-comfort-food-flavor taste! ?? And when you make your own, remember to snap a picture and share it on Instagram using #amyshealthybaking and tagging @amyshealthybaking IN the photo itself! (That guarantees I’ll see your picture! ?) I’d love to see your healthy buttermilk cornbread! This cornbread is really moist and tender, and it has lots of bright corn and comfort food flavor! It’s perfect for serving with chili, stew, or any BBQ meal. Leftovers will keep for at least one week if stored in an airtight container in the refrigerator. Preheat the oven to 350°F, and coat an 8”-square pan with nonstick cooking spray. It’s very important to measure both the cornmeal and flour correctly, using this method or a kitchen scale. (← That’s the one I have!) 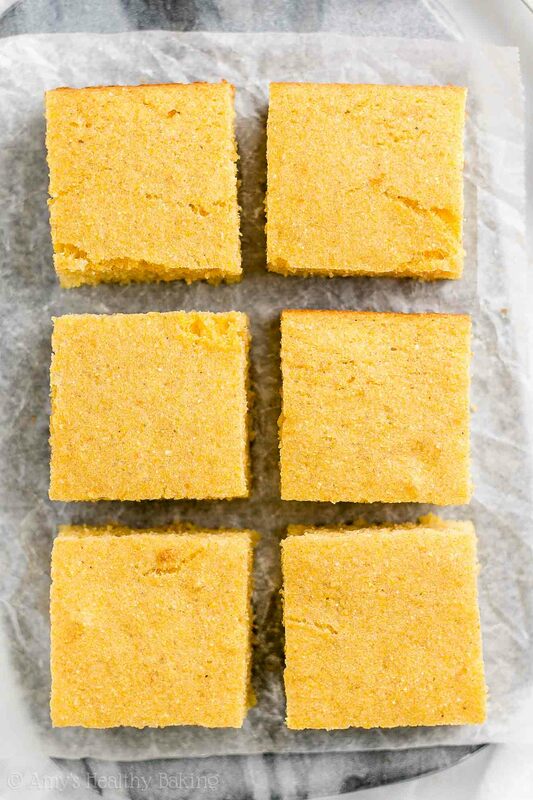 Too much of either will dry out your cornbread, instead of the moist and tender texture it should have. For the gluten-free flour, I recommend as follows: ¼ cup (30g) millet flour, 2 tablespoons (15g) tapioca flour, 2 tablespoons (15g) brown rice flour, and ¼ teaspoon xanthan gum. Most store-bought gluten-free flour blends (like this one!) will work as well, if measured like this. Pure maple syrup or agave may be substituted for the honey. We prefer our cornbread on the not-so-sweet side since we usually serve it with a drizzle of honey (and a small pat of melted butter, if you’re feeling indulgent!). If you like sweeter cornbread, substitute additional honey, pure maple syrup, or agave in place of an equal amount of the buttermilk. To make “homemade” buttermilk, add 1 teaspoon of white vinegar to a measuring cup. Add enough milk to total ½ cup. Let that mixture set for at least 5 minutes. I’d really like to make some more of your recipes but I’m struggling with white whole-wheat flour in the UK we have plain (all purpose) self raising, bread flour in white or wholemeal which is brown, nothing that says white whole wheat flour any ideas? I truly appreciate your interest in my recipes, Natalie! It turns out that in the UK (and Europe and Australia! ), most of the wheat produced is actually white wheat, as opposed to the red wheat that’s more common in the US. Therefore, your regular wholemeal flour is typically what we call white whole wheat flour in the US! 🙂 Also, I don’t recommend using self-rising flours in my recipes; other UK readers have tried and said the results weren’t good. 😉 I can’t wait to hear what you think of the cornbread — or any other recipes you decide to try! Hi,your buttermilk cornbread looks so good and tasty.Can it be made into large or mini muffins? I really appreciate your interest in my recipe, Kim! Yes, you could easily turn it into standard-sized or mini muffins. 🙂 I can’t wait to hear what you think of this cornbread! Theses look so good! My husband loves cornbread! Thanks for sharing!